The wallet is a wonderful and thoughtful promotional gift for your loyal customers, employees and business partners. 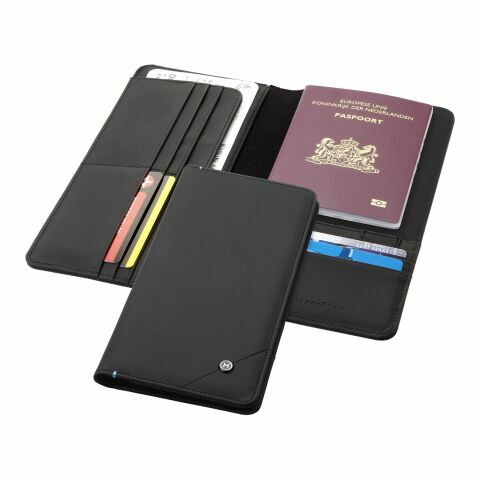 There are many different styles to choose from in this category, we have classic black wallets from Charles Dickens in durable and luxurious leather, we also stock many business card holders in PU material as well as aluminium. These wallets are of the highest quality and can be customised in a variety of ways, from choosing the colour and style to having your business design printed on the front. Any of your customers would be happy to receive such a useful and stylish promotional accessory. These promotional wallets can be the advertising ambassador for your brand. We are your reliable partner for advertising with personality. Custom printed wallets and promotional accessories work so well for a number of reasons. They exude an aura of sophistication and are greatly appreciated by all types of consumers! By giving your new and existing customer base such a high quality and well designed promotional products, you ensure that they are proud to show it off to friends and family. Meaning that you gain more brand impressions and more people become aware of your business! Why not take a look at some of our informative Wiki pages to learn more about promotional products and their benefits. The wallet is not just a safe home for our credit cards and bank notes, they usually hold so much more. A lot of people keep photos of our family and friends, identity cards and other such memorabilia in these practical accessories. A wallet is one of the highest used items out there because all of us tend to buy things day to day. Furthermore, when we find a wallet that we like, we are likely to keep it for a long time! Sometimes even months or years after! From the morning newspaper to the afternoon coffee, people see their wallets multiple times throughout the day. This is also a handy place to hold train tickets and receipts, making it even more useful and ensuring its effectiveness as a promotional item. As the quality of these promotional products is to such a high standard, your clients and business partners will associate that quality and craftsmanship to your brand and the products or services that you offer. Promotional wallets make brilliant gifts and in luxurious hardwearing materials like leather, they will show your business to be generous. Banks could gift loyal customers with these personalised items for an individuals birthday. They can also be a thoughtful sign of appreciation to the business partners, which will strengthen your relationships. Wallets are often a reflection of personality, that is why here at allbranded we offer a wide collection of high-quality wallets in different shapes, sizes, colours and materials which are sure to suit any taste. These promotional wallets would also be fantastic as part of gift bags; these could be given away inside our promotional messenger bags or rucksack and filled with other useful gifts like logo printed sunglasses, pens, keyrings, mugs and promotional caps. Wallets often hold personal value to us, by giving out personalised wallets you will establish a special relationship between the company and the recipient. Our wallets can be printed, engraved, or embroidered with your business logo to add a promotional touch. We recommend customising these wallets with your corporate design which can be applied through engraving, printing or embroidery. Adding this personalisation will help to effortlessly spread your marketing campaign far and wide to your target group. There is a plethora of choice on our website, from premium leather to black and tan brown colours, to specifically designed passport wallets and business card holders. There is bound to be a style to suit you and your business. Let these promotional wallets be your authentic and personal brand ambassadors. If you’re unsure of where to begin or have any questions, please don’t hesitate to give our friendly team a call.